Some say American made is dead but Marhar defies convention and builds decks in Michigan. Sourcing materials as locally as possible and trying to be as Eco-conscious as possible this brand is making their mark on snowboarding. Here’s how their All-Mountain deck rode. Camber Option: Mustache Rocker. Reverse between the feet, micro camber under the inserts, and slight rocker after the inserts. Conditions: Sunny bluebird with temps in the mid 40’s. Typical spring slush snow where it’s very heavy. Preconceived Notions: Decks from a relatively new company can go 1 of 2 ways. Looking at the camber profile, internals, and what it’s designed for it sounded like it was actually going to be a pretty solid deck. Flex: Insanely soft tips from the end of the inserts while stiffer between the feet. There was a good amount of torsional give. It’s not that stiff of a board probably somewhere between noodle and middle of the road park flex. Stability: The only stable zone was insert pack to insert pack. The nose and tail were so soft that they would fold when encountering any form of solid snow. Ollies/Pop: This is where the board shined through. The tips would pop huge ollies/nollies off rollers, onto jibs, even off jumps. Butterability: Those softer tips really allowed you to manipulate the board when performing ground tricks. There was a huge sweet spot for flexing the board right at the end of the insert packs. Cruising: This board never held an edge no matter what I tried. The softer tips wouldn’t let you push or even engage on edge because they would just fold. The reverse camber area between the feet mixed with the sidecut wasn’t enough to do more than slip around. The basic gist of the whole thing is think of a skateboard with really loose trucks. This reminded me of riding the Burton Custom with Flying V or Sweet Talker. Jibbing: Well soft tips with a flex point right outside the insert pack of course it locked in for presses. 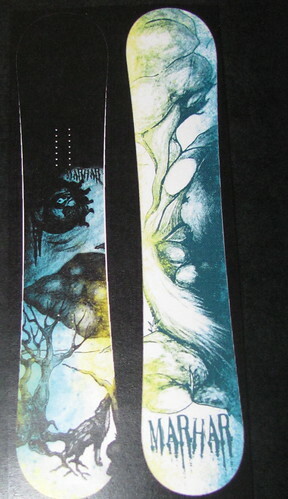 Rider in Mind: Someone that wants a hybrid alternate camber that has bamboo and a softer flex in the tips. Personal Thoughts: If I can fold an All-Mountain deck into a U shape with minimal effort it’s probably not a true All-Mountain deck. If this thing was labeled as a jibstick it might be more appropriate. The tips are so soft it’s reminiscent of riding a deck like the K2 WWW or Rome Artifact. There was nothing to it and that soft flex allowed the edges to fold when railing turns and wash out. The high point is this board had amazing pop which I attribute to the carbon/bamboo lay up. What They Say: Where innovation, creativity, dedication, and hard work collide to create the ultimate shredding tool for your riding experience.